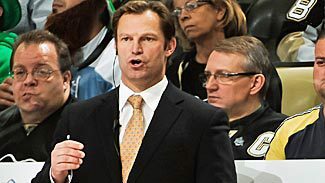 As far as situations go for coaches who are hired in the middle of the season, Kirk Muller will find himself in a pretty good one with the Carolina Hurricanes. Muller, who spent five seasons as an assistant coach with the Montreal Canadiens and took over the head-coaching job with the AHL's Milwaukee Admirals this season, will replace Paul Maurice as the third head coach in Hurricanes history. Carolina is 8-13-4 for 20 points, good for 14th in the Eastern Conference. The Hurricanes trail the eighth-place Washington Capitals -- who coincidentally fired coach Bruce Boudreau and replaced him with Dale Hunter about an hour before Maurice was let go -- by five points. With about three-quarters of the season yet to play, all is not lost for the Hurricanes. 1. Fixing Eric Staal: The 27-year-old should be entering the prime of his career. Instead, this season has been a nightmare. Coming off six straight seasons of at least 70 points in which he averaged 38 goals a season, the Hurricanes' captain has 5 goals and 6 assists in 25 games along with a League-worst minus-17 rating. Maurice moved Staal to the wing in an effort to get him going, but that didn't work. It's reached the point where it's more mental than physical with Staal, and it will be up to Muller to get his best player to relax and re-discover his confidence. 2. Special teams: They've been dreadful for the Hurricanes this season. They are ranked 29th on the power play (12.2 percent) and 21st in penalty killing (80.2). They've scored five shorthanded goals, most in the League, but that's been the only bright spot. As an assistant with the Canadiens, Muller was in charge of the PK that was ranked 11th, 11th and 7th in his final three seasons there. The dynamic power play was handled by assistant Perry Pearn, but Muller will have to figure out a way to improve it in Carolina. The Hurricanes are getting chances -- the 115 power plays they've have had are the most in the NHL -- but they have to start converting them. 3. Five-on-five: No team has allowed more goals at 5-on-5 than the 55 given up by the Hurricanes. With the team's problems on special teams, one of these two areas needs to improve immediately. Overall, the Hurricanes have been outscored 59-41 at even strength and 4-0 during 4-on-4 play. Muller needs to preach defense and have the offense come from sound play in their own zone. 4. What to do with Tomas Kaberle: Maurice's last act in attempting to right the ship was making the 33-year-old defenseman a healthy scratch for Sunday's 4-3 loss in Ottawa. What Muller does with Kaberle should be interesting. Signed to a three-year, $12.75 million contract this summer, Kaberle hasn't scored a goal in 24 games. He's received the sixth-most minutes per game among Hurricanes defenseman. Perhaps sticking with rookie Justin Faulk once Joni Pitkanen is back from injury is the answer. The 19-year-old has been playing more than 23 minutes per game since his recall 10 days ago. He hasn't been great, but neither has Kaberle. 5. Help for Cam Ward: The 27-year-old appears to have hit a wall, be it a mental one or physical one. He's appeared in 99 of the Hurricanes' previous 111 games, leading the League with 74 games played last season. He's tied for the lead with 21 games played this year. Backup Brian Boucher didn't exactly give Maurice a lot of reasons to use him more with an .877 save percentage in six appearances and four starts, but Boucher helped get the Flyers to a Stanley Cup Final two seasons ago. He's capable if he sees the net more regularly. Ward could also use help from the guys in front of him. He has faced 654 shots this season, the most in the League. 6. Go on a Zac(h) attack: Zac Dalpe was among the preseason favorites for the Calder Trophy, but the 22-year-old has spent most of his season in the AHL after failing to register a point in nine games over two separate stints with the Hurricanes. Dalpe spent most of his time playing on the fourth line with Tim Brent and never played more than 8:23 in a game after playing 10:38 in the season opener. Perhaps surrounding Dalpe with more talented forwards and not fourth-line grinders is the answer. The same can be said for Zach Boychuk, who has tons of promise but has bounced between Charlotte of the AHL and Carolina this season. Boychuk had two goals in a Checkers' victory Saturday night but wasn't getting a lot of minutes with Maurice as coach.